There’s a smartphone in your pocket everywhere you go. You can make phone calls with it using the built-in microphone. And with easy to use recording apps, you the ability to easily record in-person interviews, lectures, and meetings. But when you re-listen to these recordings, the audio just doesn’t sound quite right. Sometimes the audio sounds muffled, or there’s a lot of intrusive background noise, or you can’t easily discern certain words and phrases. Don’t worry, this is completely normal. Bad audio quality is something that you and your listeners can quickly detect and be frustrated about. Not only is it hard to listen to, but it’s hard to understand what is being said. Automated transcription services such as Sonix have a hard time with low quality audio recordings. What should you do? Well, you don’t have to buy thousands of dollars of gear or book a recording studio to have great sound. It’s easy to capture great audio from your phone by simply tweaking a few key settings, changing how you record, and for the best results: invest in a portable microphone. Put your phone on airplane mode and mute your notifications. By putting your phone in airplane mode, you prevent phone calls and text messages from interrupting your recordings. Also, most phones have a “Do not disturb” feature, this will prevent notifications and vibrations from interrupting your audio recording. Voice Record Pro is a more powerful version of the built in Voice Memos app. You can control the gain, sample rate, bit rate, and encode quality. You’ll need to use trial and error to see what settings will suit the environment that you are recording in. Try a short test recording and re-listen to it with headphones to see what settings decrease the environmental distortion and sounds clearest. Titanium Recorder is a powerful voice recorder. Tap the menu button (it has three dots in the top right of the screen) and choose Settings. Here, like in Voice Record Pro, you can adjust the sample rate, bit rate, and gain to make sure that your audio recording is clear in the environment that you are recording in. Just like above, try a short test recording and re-listen to your recording with headphones and change the settings as necessary. Ensure that your microphones are not covered or obstructed. First, find where your phone’s microphones are located. They are usually at the bottom of the smartphone because that’s where you’d speak into if you were making a phone call. They could also be by the camera(s). Just make sure that when you are recording, you don’t have a case or your finger covering these microphones. By uncovering your microphones, you will prevent your recording from sounding muffled or garbled. Point your microphones towards your main speaker. Most phone microphones are directional and if your microphones are pointed away from the main speaker, it relies on the echos or reverberations of the speaker’s voice off of the wall or table. These echos are really hard to decipher and cause the audio quality to be very poor. For big rooms, bring the microphone closer to the speaker. If you are recording in a conference room and want to better transcribe your meeting minutes, pass the phone around from speaker to speaker. Having the microphone closer to the speaker will make the audio sound much better. Also, if you are recording a lecture or a speech, sit in the front row if possible; do not try to record from ten rows back. An external microphone will give you the best audio quality. By supercharging your phone with an external microphone, you will ensure that you have the best recordings. However, it’s a challenge to choose which microphones will work best with your phone. iPhones require the microphones to have a Lightning connector, while Android phones require the microphones to have a USB-C connector. The hand-held Sennheiser HandMic Digital is ideal for recording speeches and is great for mobile journalists, podcasters, and musicians. It is a top quality microphone with a high-quality cardioid microphone with a shockmount – which allows it to significantly reduce handling noise while recording only the speaker and eliminating any side noise. It has a lightning adapter so you just plug it into your iPhone and you’ll have instant broadcast quality recordings as long as you hold the microphone close to the speaker. The Sennheiser HandMic Digital Microphone is available on Amazon for $259. The Shure MV88 iOS condenser microphone conveniently connects to the bottom of your iPhone and provides a stereo microphone to capture more of the surrounding environment instead of just one speaker. It automatically can adjust the EQ, compression, and limiting features to guarantee that you always get the optimal results. This microphone is built for the on-the-go journalist for when you need a quick and easy microphone to record that on-the-record interview. The Shure MV88 iOS Digital Stereo Condenser Microphone is available on Amazon for $149. The desktop Beyerdynamic Fox Microphone is a studio grade quality microphone that you can put on a desk or a table when recording and it will give you great audio quality over USB-C. It has a large diaphragm condenser capsule that will accurately reproduce your voice and eliminate a lot of environmental noise. The Beyerdynamic FOX USB Condenser Microphone is available on Amazon for $149. The Apogee MiC Plus is a professional studio quality microphone that you can plug into both your iOS devices (iPhone, iPad), Andoid, or Mac/PC. This microphone is incredibly flexible and can record any sound from interviews to podcasts to vocals to music. 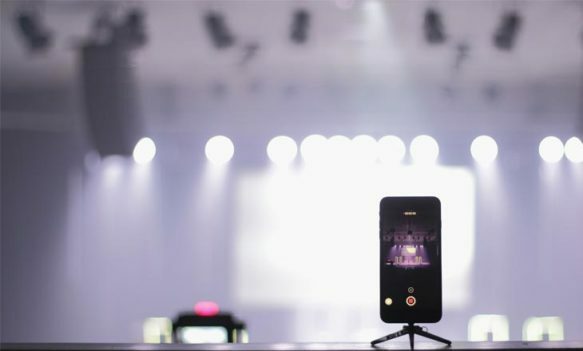 It’s small enough to fit in your pocket so it is perfect for recording on the go and has flexible connectivity over both lighting and USB-C. Just plug it into your phone and you are ready to get a high quality recording with increased dynamic range. The Apogee MiC Plus is available on Amazon for $259. For a more subtle approach, you might want to consider clipping a lavalier microphone to a tie, shirt, collar and then run the cable to your phone under your clothing. This is great for capturing great sound during a video without having to hand hold a microphone. A lavalier microphone helps capture high-quality, clear sounds because by clipping it to your clothing you guarantee that it is only capturing your voice. The BOYA Lavalier Microphone model BY-DM1 is the iPhone/Lightning version that’s available on Amazon for $69.95, and the BOYA Lavalier Microphone model BY-DM2 is the Android/USB-C version that’s available on Amazon for $69.95. Not only will having high quality audio recordings improve the quality of your automated transcriptions with Sonix, they will also benefit your listeners who have a higher likelihood to stay better engaged with your content. If you only were to do one thing as a result of reading this article, we would highly suggest that you add a portable microphone. Or if you are truly rebellious, you can add a standalone portable digital recorder such as the Zoom H1n Portable Digital Recorder (available on Amazon for $139.95) and have a fully dedicated, pocket-sized device for your recording needs. Transcribing and editing audio and video is painful. Sonix makes it fast, simple, and affordable.